AyaNova, offered by Ground Zero Tech-Works, is primarily a Windows-based on-premises service management software that enables users to perform end-to-end management of service work orders including capturing order history, work order scheduling, quote generation, inventory management, and customized reporting. The product also offers web-based and mobile interfaces, enabling remote login for users that are either based in the field or need to access product features on their laptops while they travel. AyaNova offers features such as scheduling that enable managers to assign service schedules to employees based on their dispatch zones, certifications or skill sets by a simple drag and drop operation. The product also enables users to receive notifications on upcoming events and dispatch schedules through several mediums such as memos & pop-ups, emails, or text messages. The asset management functionality of the product enables service professionals to track asset history including meter readings, warranty coverage information, and banked services. The inventory management feature helps users to maintain an accurate account of the inventory by tracking parts, tracing inventory to multiple warehouses, and monitoring purchase orders. The product also offers powerful reporting features with over 100 standardized templates, and the creation of customized reports for billable hours and the response time, among other parameters. AyaNova offers integration with third-party accounting softwares such as QuickBooks, with add-ons such as Microsoft Excel, and also imports and exports data in CSV and XLS formats. The product’s clientele is spread across Canada, United States, United Kingdom, and Australia, among others. Key customers include OneCare Computer Consulting, Advanced Computer Technology, Compnet Internet Services, and ISUS Technology. Software by Ground Zero Tech-Works Inc.
We purchased this software in 2012 and paid for the full version, up front. One of the primary reasons we chose AyaNova was because support was included in the price. They have since changed to a subscription model and I can no longer get the included support I was promised. I do not need nor want to sign up to the subscription service. Their manual seems to be purposely vague so that it's difficult for me to even implement the features and functionality that I PAID for without asking for some guidance, which is now of coarse, charged. Make sure you shop around before deciding that you want AyaNovaDoes most of what I want it to do. Fairly steady and reliable. We had been providing free support and updates for AyaNova since its initial 1999 release. I used this software from the day I started my company and it lasted a good 4 years before I had to find something new. All in all, it was a fantastic bit of software for the price I paid and the result I got.This application has VERY good customisation - I was able to edit almost every field. You can create basic to advanced reports. Available add ons (for additional cost) give you more power for the app, like being able to export to csv/xls or use the software in a web browser. In my entire time using the software I never experienced any bugs. I run a mobile outdoor power equipment service business and my business model is different from the typical OPE dealer. No one in my industry has anything like this software. Even though it was designed with computer service in mind it works like they had my business in mind. I was able to constomize this software to reflect all the regular jargon and data recording a typical OPE business needs but with the advantage of having a schedule and work order system that is superior to anything else available for OPE dealers. Most software vendors for OPE do not even have a scheduling feature. The ones that do are priced out of sight. I can highly recommend this software to any mobile service business or any business that has to schedule work orders. The service from Ayanova is also outstanding. You will not be left hanging on anything and the response time to most of my questions were within minutes. Wish all my business relationships were like this! Way to go Ayanova!This software can be customized right down to the field labels. So can be matched to any service business. It is very natural to use the software. It works like you think and that is remarkable. It is a real efficiency booster. Nothing gets lost in the system. The search feature allows fast access to any record in the database. Any fact about a customer or repair you can think of can be recorded with Ayanova and you can link any external file to any customer. 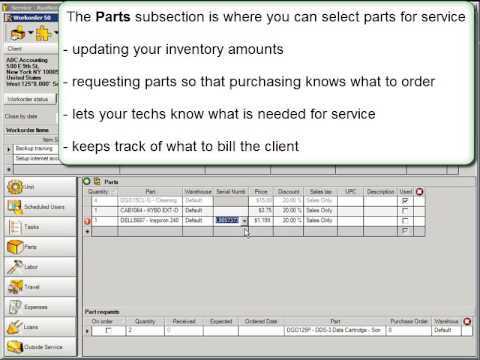 I have all my PDF parts lists linked to my customers equipment records so its a quick button to find parts on the job. Expandability is unlimited. Cost to buy is very reasonable. Support is second to non. The Quickbooks interface lets you keep your accounting just like it was. This was how I found Ayanova. I was looking for a Quickbooks add on that could manage workorders. What I got was this awsome software package that has exceeded all my expectations. I do not use the software myself, I can only speak to the installation, configuration, upgrade and backup/restore functions. Overall, again, because of exceptional customer support by Joyce, my experience was truly extraordinary. Early in my technology career I did a 3yr stint in technical support for a major hardware manufacturer, so I'm pretty critical of customer and technical support. Joyce blew me away with the level of detail, patience and complete understanding of the product and her communication.My review of AyaNova and the Firebird database engine is from the perspective of installation, backup, maintenance and migration. My client has been using the application for years and we needed to move it to new server hardware. I had no idea about the product, but Joyce with Ayanova provided all the documentation, review and recommendations necessary for me to get in, upgrade their current server installation, backup their database (first time in 4yrs), upgrade their client PCs and then migrate to new server hardware. Even without knowing the application, Joyce walked me through the process, corrected me where I was wrong and made sure I paid attention to the important stuff. She went well above and beyond the call of duty to help ensure that our shared client's experience was excellent. The process I went through wouldn't have been as smooth without Joyce. Period. My review of AyaNova and the Firebird database engine is from the perspective of installation, backup, maintenance and migration. My client has been using the application for years and we needed to move it to new server hardware. I had no idea about the product, but Joyce with Ayanova provided all the documentation, review and recommendations necessary for me to get in, upgrade their current server installation, backup their database (first time in 4yrs), upgrade their client PCs and then migrate to new server hardware. Even without knowing the application, Joyce walked me through the process, corrected me where I was wrong and made sure I paid attention to the important stuff. She went well above and beyond the call of duty to help ensure that our shared client's experience was excellent. The process I went through wouldn't have been as smooth without Joyce. Period. The software design itself does not make the upgrade, backup or migration process particularly straight forward. It can get cumbersome with command line calls, editing and executing batch files and manually moving files around. That said, the process became much clearer and the upgrades, installations, backups et al went without a hitch due to Joyce's clear command of the process and the product. The software is great. It's very flexible. And after nearly a year of using it, the answer to almost every question we've had like "I wonder if Ayanova does that?" has been yes. And we've found ways to improve our effectivness and efficiency as a company using Ayanova. The approach you must take is self-guided. The help files and the forum have 99% of the answer right there. As with any software, there is a learning curve, but it's really helped our business move to the next level.Hands down best value on the net. Awesome software, but more importantly a GREAT company. Support is often immediate and they follow up if you don't get back to them. They are truelly interested in you having a great user experience. Support like that is rare. ●	The product offers its users several configuration options including deployment for stand-alone systems, LAN-based systems, remote access for users in the field through mobile devices or accessing data from multiple offices. ●	The solution offers a web browser interface option that provides online access to users of processes such as dashboard, schedules, work orders, quotes, parts, reports, and inventory data. ●	AyaNova also provides both a mobile-responsive web interface with full functionality, and a text-based mobile browser interface enabling users to view and edit text-based work order pages. ●	The product offers integration with add-on modules such as Microsoft Outlook, as well as allowing the import and export of data in excel or CSV format. Below are some frequently asked questions for AyaNova. Q. What type of pricing plans does AyaNova offer? Q. Who are the typical users of AyaNova? Q. What languages does AyaNova support? Q. Does AyaNova support mobile devices? Q. Does AyaNova offer an API? Yes, AyaNova has an API available for use. Q. What other apps does AyaNova integrate with? Q. What level of support does AyaNova offer? Q. Which apps is AyaNova compared to most often?